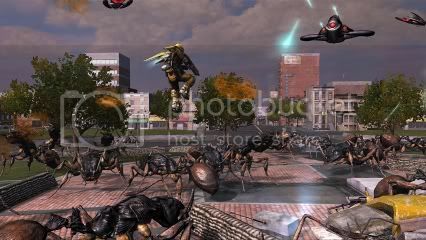 Not one to miss out on some B-movie bug-huntin’, resident Earth Defense Force war journalist Joe got in touch with Brian Ethridge, Senior Producer at D3 Publisher, to talk about the upcoming Western take on EDF, Insect Armageddon. 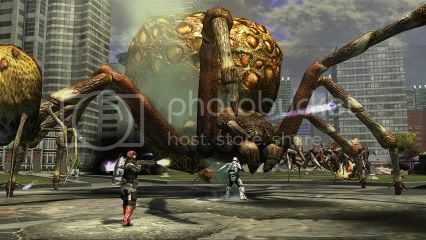 CG: Earth Defense Force: Insect Armageddon is set in Detroit, whereas Earth Defense Force 2017 was set in Japan, what’s the story behind the change in locale? BE: So, the first three were done by Sandlot in Japan, so they based the game in Japan. This time we brought it over to the States – it’s being developed by Vicious Cycle – so we decided we’re going to do it in America, as a sort of Western EDF. You play as a member of Strike Force Lightning, tasked with defending the city of New Detroit. BE: This is a cool mechanic, we wanted to handle the ant hills a little differently this time, to get people to use co-op. Someone has to cover you while you plant an explosive. CG: They took up a weapon slot. 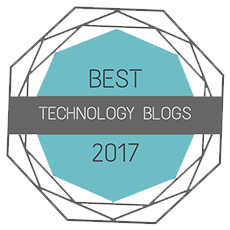 BE: Exactly, so we wanted to make a class that’s sort of dedicated to that. They can have those deployables on them all the time. You can have different types of turrets – machine gun turrets, plasma turrets – you can have up to three equipped at any time once you reach level four. You have to earn those upgrades as you level up your character. CG: So you level up now? BE: We wanted to give people something to sink their teeth into. They can stick to one character for a long time and get rewarded for it. It’s not a case of getting weapon drops and farming certain levels to get what you want. This time you can purchase weapons and earn XP to upgrade yourself. Players will advance up to level four, maybe three by the time they’re done with the first campaign playthrough. We wanted to make sure there’s always something more for you to get. To get to level eight on one of your armors is probably going to take you forty to sixty hours depending on how you play. CG: And level eight is the highest? BE: Yes, and that’s on one armor set. You have four armor sets you can upgrade. We looked at how Call of Duty does the progression stuff – we looked at prestige mode and I don’t know, you go into prestige mode and you’re kind of like, “well, I just lost everything I earned, and what did I get? Another star next to my name?” We wanted to give you something fresh to advance with. So you can level up one armor set fully and then move on to another and it changes up the gameplay. CG: And what are the different armor types? BE: Well there’s the tactical armor, he’s our turret-based guy. We also have the battle armor, he’s sort of your big, heavy tank dude. Battle armor is great because he has an energy shield that you can use to block incoming fire or soak up damage from his own explosives. One of the things about 2017 is that you always blow yourself up when you get the big weapons. Battle armor’s whole thing is that he can always use those weapons. He’s meant to use explosives up close. CG: So we just saw you pick up a weapon, what’s the deal with that? BE: Well, that was an elite enemy weapon drop. When people first started hearing that we had gone exclusively to a weapon buying system, they weren’t happy. We decided to bridge the gap between the two. CG: Fans liked 2017 as much for its issues as they did for its good things, what was the balance of figuring out what you fix and leave alone? BE: We knew that people wouldn’t be too upset with updating the graphics as long as it didn’t mean messing with the gameplay. We tried to be very conscious of things like making sure we have enough enemies. However, the big thing this time around is co-op. With co-op, enemies now come at you from all angles. In 2017 you had these situations where you’re sitting there and everything is pouring down the street and you just sit there kind of like Jesse “The Body” Ventura in Predator. We have those moments but we want to make sure that when you’re playing with your buddies everyone has something to shoot at. We tried to improve the AI. I don’t think people will be too upset about that. At first, we had cut out split-screen mode. People were very upset about that. We really wanted to listen to the fans and make them happy, so we extended our schedule a bit and got split-screen back in. CG: And what about the dialogue? We heard a bit of it, and it almost seemed…good. BE: I don’t know if you’d say that if you heard all of it. Knowing we made this in the States and not in Japan, if we tried to imitate them, we wouldn’t be happy with that we came out with. We couldn’t force ourselves to make bad English dialogue, so we took a different approach. We wanted to make it like an over-the-top, super-ridiculous, Michael Bay on steroids action movie. We have these four guys that hang out with you, Cyrus, Kid, Kicker, and Old Man, and they’re always saying things like, “You know man, when I get back home I’m just gonna have a beer.” Stupid things like that have the same vibe as EDF. CG: So New Detroit? Isn’t Detroit crappy enough? 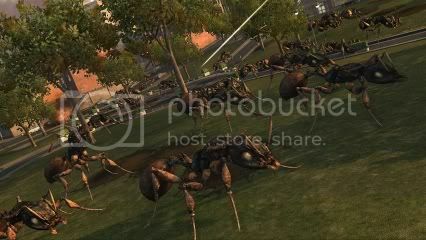 Did it really need a bug invasion? We had this city we’d made – it was a fictitious city without a name – and as we started to finish it up we thought it looked like Detroit. We didn’t want the game to take place in New York. Everything takes place in New York. So we decided to make this New Detroit. Maybe it’s built on the foundation of old Detroit, maybe it’s somewhere else, but the point is that it’s a different time and place, and it’s a city that’s willing to be blown up. CG: Is there a release date? 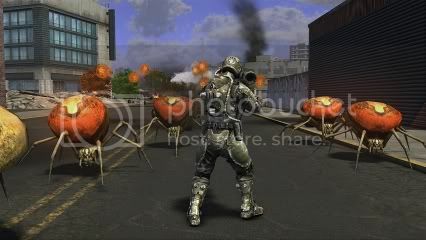 BE: Yeah, Earth Defense Force: Insect Armageddon is coming out July 5, 2011 on Xbox 360 and PS3. It’s also coming out at $39.99, the same price as 2017.